and safety of our expeditions . 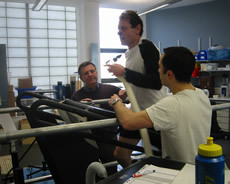 My fitness is being monitored by Professor Clyde Williams and Ian Rollo who work as part of the Sports Research team at Loughborough University, this is overseen by Professor John Feehally a consultant Nephrologist at the University Hospitals of Leicester. Additional advice has been given by Chris Imray a transplant surgeon and mountaineer who has summited Mount Everest and Dr David Hillebrandt an expedition doctor and medical advisor. Also my own transplant surgeon Hany Riad, Manchester Royal infirmary, has been involved at every stage. Recently Pete Mcnight kindly offered his support, he is a strength and conditioning coach, based at Loughborough University, with the English Institute of Sport. 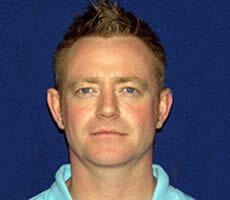 Pete trains and coaches Olympic athletes and is helping to build and improve my overall strength. 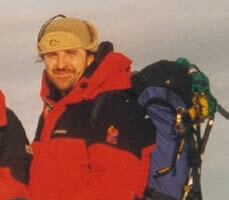 Kevin is a fully qualified mountain guide and has worked as a winter mountaineering instructor at England’s National Mountaineering centre - Plas-y- Brenin. 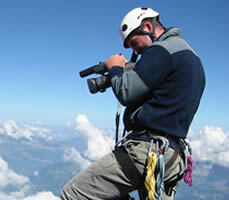 He and his wife Winky now run their own business offering winter mountaineering courses in Scotland. For the rest of the year they offer a guiding service to most mountain regions of the world including the Alps and Himalayas. Simon heads a team of safety technicians for an outdoor based personal development company and is a keen ski mountaineer. When time and money permit he can be found wandering some of the more remote regions of arctic Norway. 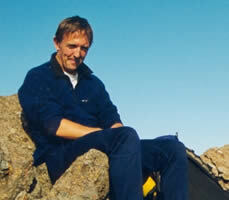 One of his most notable achievements was in 1996 when he completed a 2000 mile north-south traverse of Scandinavia. This unsupported journey took one hundred days to complete. Bob’s real expertise is in the remote jungles of the world, where he works as a jungle survival instructor and expedition leader. He now runs the only UK based jungle training school for expedition leaders. In recent years he has 'seen the light' and taken to the mountains and has successfully climbed in many places including Alaska, South America, Morocco and Thailand.